However, school buses are only ever yellow. You never see black, brown, silver or tan school buses because these vehicles carry precious cargo and must be immediately apparent to everyone on the road. When were school buses first painted yellow? Prior to 1939, standards for the construction of school buses did not exist. In fact, many children across the country were traveling to and from school in multi-colored buses, trucks and even horse-drawn carriages. Frank W. Cyr, the father of the yellow school bus, organized a conference at Teachers College, Columbia University, in 1939 to create a basic set of rules about how school buses should be manufactured and painted. Attendees of the conference included Blue Bird Body Co., Dodge, Ford, Chevrolet and International Harvester. Additionally, paint specialists from DuPont and Pittsburgh Paint were also in attendance. At the conference, many aspects of school bus construction were established — body length, ceiling height, aisle width and bus color. Today, most of these standards have since evolved. However, one still remains: the stand-out yellow coloring. Did you know that federal law does NOT require school buses to be yellow? 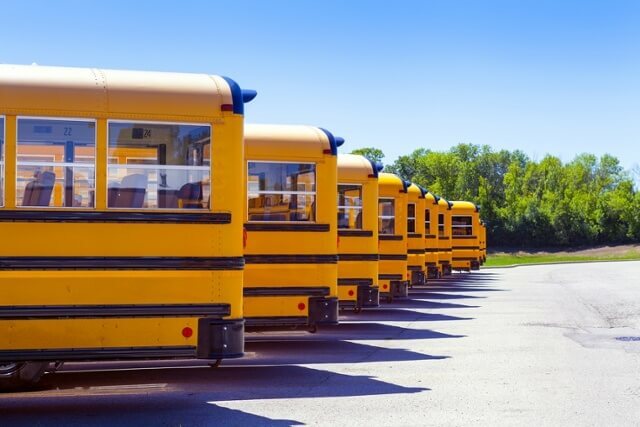 According to the National Highway Traffic Safety Administration (NHTSA), each state should create procedures to meet certain recommendations for identification and equipment of school buses, but they are not required to do so. Thus, it is the responsibility of your local or state government to create safe transportation guidelines for the schools in your city or town. Be painted National School Bus Glossy Yellow, in accordance with the colorimetric specification of National Institute of Standards and Technology (NIST) Federal Standard No. 595a, Color 13432; except that the hood should be either that color or lusterless black, matching NIST Federal Standard No. 595a, Color 37038. Have bumpers of glossy black, matching NIST Federal Standard No. 595a, Color 17038, unless, for increased visibility, they are covered with a reflective material. Is yellow really the best color for school buses? What is the most eye-catching color? Many people believe red is the most alarming and noticeable pigment. However, red is used for stop-lights, stop signs, yield signs, warning signs, biohazard signs and, believe it or not, it isn’t the most easily noticed color. During the 1939 conference held by Frank W. Cyr, it was established that yellow was the most visible paint to the human eye. However, school buses aren’t entirely yellow. They are actually a combination of orange and yellow. This color mix was created because black lettering appears more visible on it than on a pure lemon-yellow background. Scientists also found the rods in our eyes (peripheral vision) are more sensitive to the color yellow when our attention is focused on objects straight ahead of us. Maritime workers and sailors often turn their head to the side to spot lights at night in the distance. The next time you are in a dimly lit area and think you may see a light in the distance, turn your head and you will notice the yellow light is brighter in your peripheral vision. Drivers can spot yellow vehicles more easily in a fog, storm or hurricane. In the early morning and night, yellow is the most discernible color on the road. Yellow is a strong warning color in nature that we have evolved to notice — think of bees, wasps, scorpions, flowers, etc. Most roadways in America are painted with a double yellow line and thus as drivers, people are trained to obey the color yellow.